2014 was a year that started off with a very dry spring, producing early water deficit stress on the vines and was followed by one of the most mild and cool summer months in Lodi in decades. In fact, June, July and August were cooler than September, October and November. Because of this, we had exceptionally long hang time for the fruit, giving it the chance to develop layers of flavors. Combine that with the low yield of our 120-year-old Zinfandel vines, and you can see why we were so excited by the intensity of the fruit. Plus, with 75 acres of what is the largest single block of head trained, natural rooted Zinfandel in the country, we had the opportunity to truly hand select the “cream” of the crop, making several passes through the block during the optimal ripeness window in late October of 2013. This ensured the fruit going in remained true to form for our flagship wine. After hand-picking into half ton bins for the most delicate transporting of the fruit, the grapes were lightly crushed into the tank for fermentation. Fermented on the skins to dryness, it was then pressed and placed in French and American oak barrels, of which 15% was new wood. Aging in this way, it was important to maintain and uplift all of the fruit components while using the oak to support each flavor to its fullest. After bottling, it was allowed further aging time to micro-mingle its flavors so each bottle is a full expression of the monarch of Lodi wines – ‘The Immortal’ Old Vine Zinfandel. The color of this wine is truly Immortal. Its rich dark color goes on and on and on. The deceptively subtle aromas of this wine combine red current, raspberries, red cherries, with earthy cedar marrying together to put your olfactory senses into a new dimension. In the mouth, the palate is wrapped in a mysterious, velvety layered mix of raspberry cordial, sweet mouth filling red fruit, blackberry and red current, leading to a lengthy rich mouth filling almost breathless finish. This is a wine for great food, friends and conversation, or an intimate meal for two by a flickering fire. 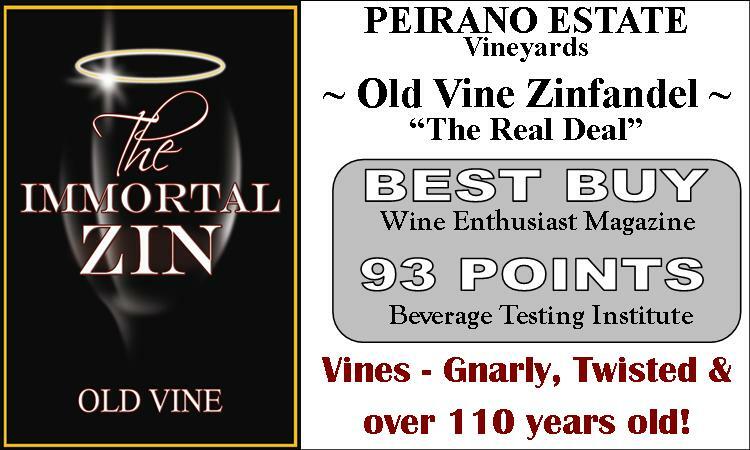 Whichever your pleasure, our “Immortal” Old Vine Zinfandel will make it memorable. Alc. ; 14.9%, Drue; Old Vine Zinfandel Estate Grown from Lodi, California.